Inspiration can come from many different places and in many different forms. This article will demonstrate how the use of another photographer’s style helped me craft a series of images at a time when I was struggling to see an image of my own. This is not about plagiarism; it’s about using another’s style as a starting point to help inspire a unique work of your own. This approach could potentially save you from coming home empty handed and disillusioned. I found myself at the Fairy Pools on the Isle of Skye. A location I have long dreamed of visiting. Things were not going well. The weather was dreadful – rain, mist, wind and general dull weather were not conducive to the beautiful images I had envisioned in my mind for so long. 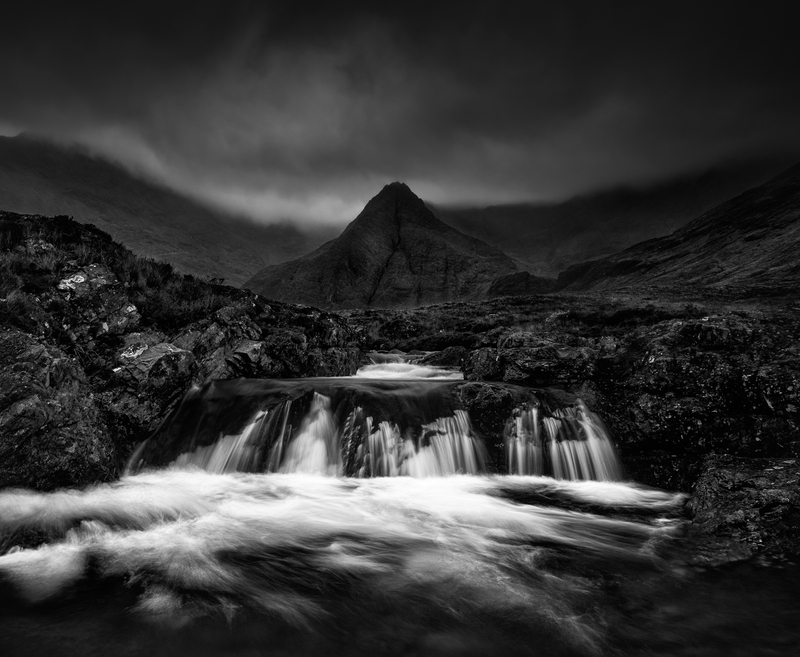 My mind kept jumping back to a wonderful image of the same location by Joe Cornish. I found it in a book that sat on a shelf in the pub next to my accommodation on Skye. It would never happen. Wrong time of day, year and weather. There was no way I would better it or possibly even match the quality of the thousands of other images taken here each year. The weather was miserable at best. I’m not ashamed to admit it – I was struggling to find an image. Time was passing quickly and I needed to leave for my intended sunset location. I had tried many differing approaches – in the river, at the side of the river, up high, down low, long lenses, wide lenses and even intimate detail isolation shots. None of it was really floating my boat. My inspiration was drying up fast. I reached a point where I was standing contemplating attempting Intentional Camera Movement abstract images in a last ditch attempt to make an acceptable shot. Then it hit me. It had been before my eyes all along, I had just failed to see it. There was a very small bend in the river leading the eye towards the mountains in the background. My mind instantly jumped to the works of Ansel Adams – the weather was going to suit it perfectly. Serge Rameli has recently run a series of YouTube videos where he processed images in the style of Ansel Adams. Having watched all of these, it probably sparked the inspiration which lay dormant somewhere deep in the recesses of my mind. This was my starting point, I was already 2/3’s of the way up the river and had probably missed a lot of images which could have been made in this style. The light was fading and I knew I had not long to make it work. However, the next 30 minutes were very productive. I came away with a series of 3 images which blend perfectly together in this style. I have not seen the area shot in this style before so I came away happy I had fashioned something slightly unique which oozed the dark mood that I love by the bucket full. The inspiration taken from somebody else’s work was merely my starting point – the rest was all my own conception. Plagiarism in landscape photography is probably far more difficult than people imagine because the light and weather change things so much. It would be far easier to focus on creating your own images. I have yet to visit a location where the scene has ever been the same twice. Yes there are popular locations, the Fairy Pools being a classic example. Put 20 competent photographers in the same location at the same time and they will more than likely produce 20 slightly different works. I cannot understand photographers who make the claim that they do not look at the work of others for fear that it would taint their own vision. Maybe my point of view will change in time but I love photography. I want to look at great work and be inspired and driven to improve by it. Social media makes it near impossible not to be bombarded with imagery in this day and age. How can you possibly plan a photography trip if you don’t look to see what’s there – surely these guys don’t throw a pin in a map and say “I’m going there”. 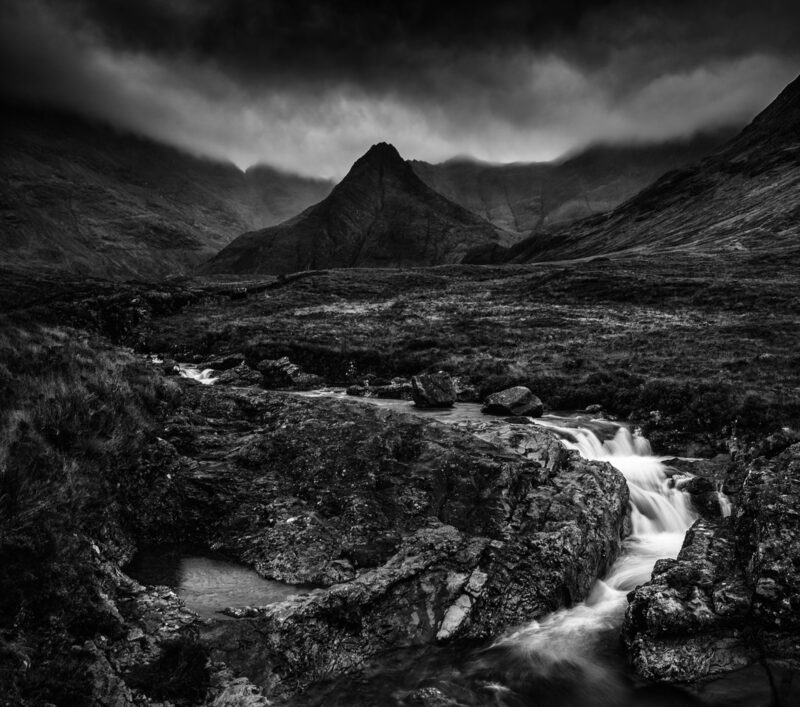 Ansel Adams certainly never visited the Isle of Skye. My work would never stand side by side with his but finding inspiration in his style helped me immensely. The alternative was to come home with no images I liked from a location I had long wanted to visit. Nice writeup Graham and I completely agree with you. Inspiration from other photographers always plays part in my own photography. Not so much the images that those other photographers produced but rather than mindset and thought-processes for how they produce or process an image. Nice article – great images. I often find it useful to re-visit images taken some time ago. Sometimes weeks or months ago. I think sometimes the mind sees something that the eyes do not see at the time. Thanks John – I usually find the second post processingattempt is always far better. A great read Graham and beautiful moody images you captured too. I always research a place before I visit it to see what compositions there are and 9 out of 10 times I will come away with something different. We all are inspired by others every day is indeed a learning day in photography.